If you are building or renovating a home, here are a few things to consider. They don’t build homes and furniture like they used to. Now, they burn faster. New technologies and product advancements are making us more efficient and more productive. But there is a cost, and that cost is risk. 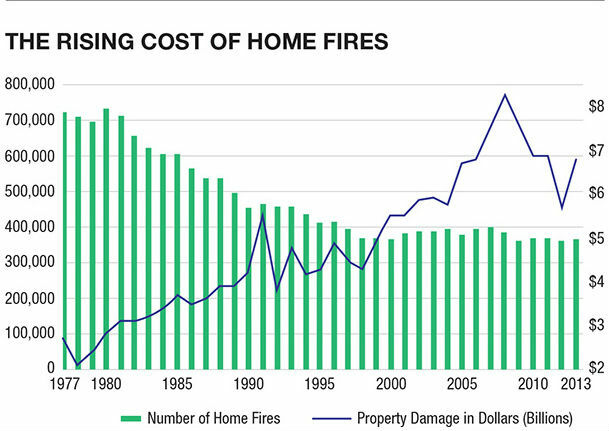 According to the National Fire Protection Association (NFPA), while the number of home fires that occur each year has fallen by nearly 50 percent since 1977, the total amount of resulting property damage (in dollars) is increasing. Homes today burn an estimated eight times faster than in past decades. In fact, flashover, the point at which intense heat causes an entire room to become engulfed in flames, now occurs less than five minutes after a fire starts, whereas it used to take 30 minutes. This faster progression gives homeowners, firefighters and other first responders less time to react, creating significant hazards to safety and property. Building materials. Years ago, a 2×4 actually measured 2 inches by 4 inches. Today, due to the way lumber is mass produced, it’s 1.5 inches by 3.5 inches. Though the change is slight, consider all of the 2×4’s that make up a home’s frame and the difference in materials becomes significant. Less material to burn means a faster collapse time. 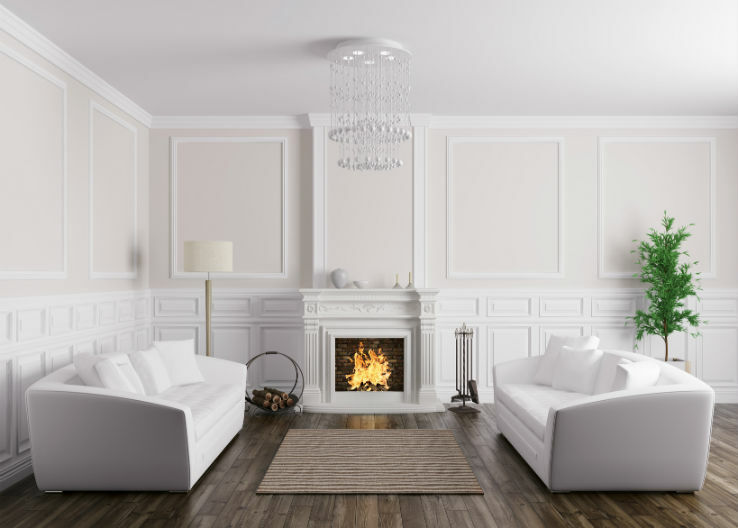 To make matters worse, in many instances, home frames are not constructed of natural wood but rather particle board and other manmade materials. 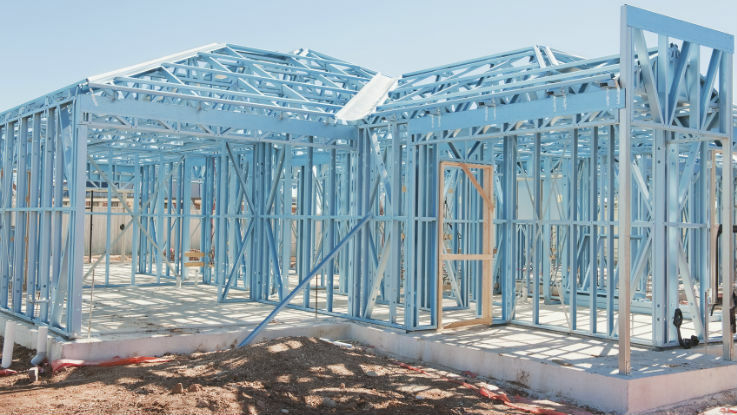 These materials are more lightweight and less expensive, making it possible for builders to construct larger homes more quickly and at a lower cost. However, these materials are also less dense and contain highly flammable petroleum, so they burn much more quickly. Synthetic furnishings. Carpets, drapes, cushions, pillows and even mattresses are typically made of synthetic materials that contain plastic or polyurethane foam. These burn as quickly as gasoline and often produce a thick, black, toxic smoke making firefighting difficult. Larger constructions. Homes are built larger today than they once were. Bigger homes often include more furnishings and personal contents, increasing the fuel load. Window constructions. With increased fuel loads in houses, the amount of oxygen available to feed the fire has become the limiting factor, making windows an important component. 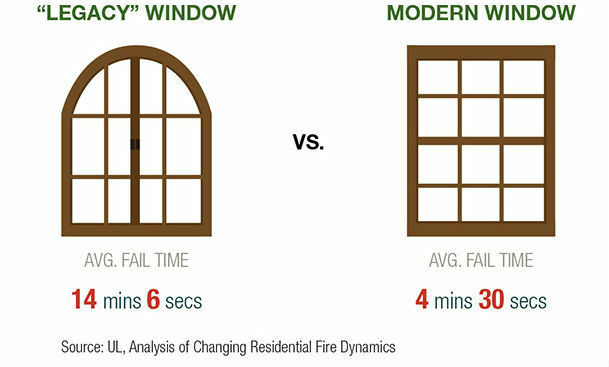 In a UL study that compared the burn rate of older (“legacy”) windows with their modern-day counterpart, the modern windows failed an average of three times faster, for two main reasons. First, older windows have thicker glazing, resulting in thicker glass. Second, legacy windows are held in place with a putty-like substance that allows the glass to expand, whereas the modern versions are fixed tightly into the frame for greater energy efficiency. Unfortunately, in the event of a fire, this puts stress on the glass as it heats. 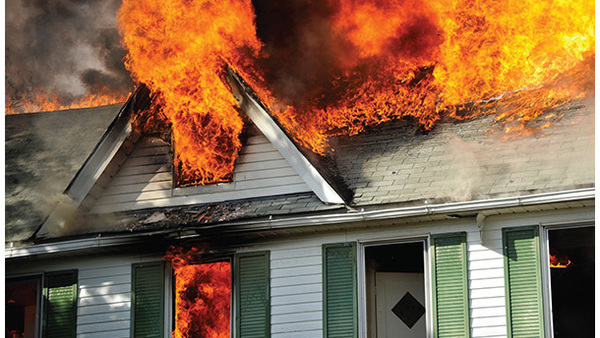 Click through the slides to learn seven ways to mitigate home fire risk. Concrete, steel, masonry, solid wood and other traditional building materials have a lower burn rate than manmade materials like particle board, composite wood and veneers. For the home’s frame, use either concrete or solid wood with metal studs. 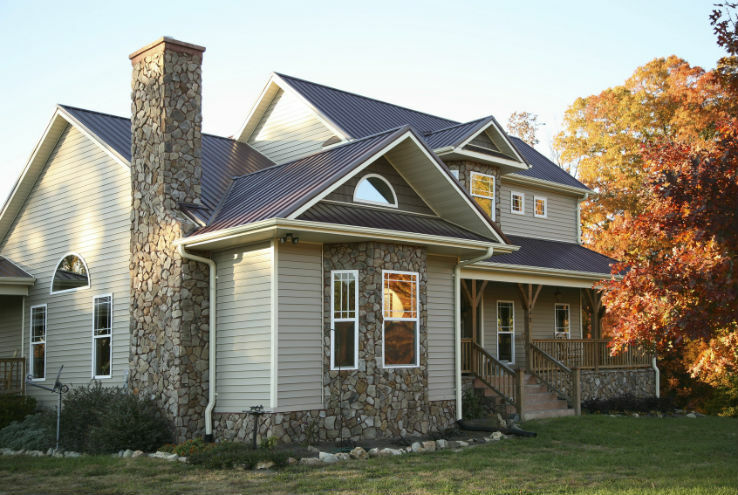 For walls and siding, select a fire-rated material like stucco or fiber cement. Tempered glass is four to five times stronger than standard glass and it’s more heat resistant. For window framing, steel offers the best fire protection, followed by wood and aluminum. Vinyl is the least effective. In the event of fire, this will automatically turn on and alert a central station. And unlike a wet system, the pipes of a dry sprinkler system do not contain water, so the risk of a burst pipe is eliminated. A sprinkler system can be installed at any time, but it’s much more costly to retrofit an existing home with one than to add it during the building process. 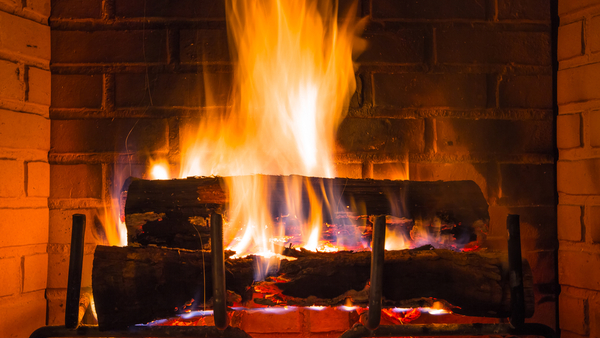 Keep flammable items away from fireplaces and heaters and exercise caution around lit candles. 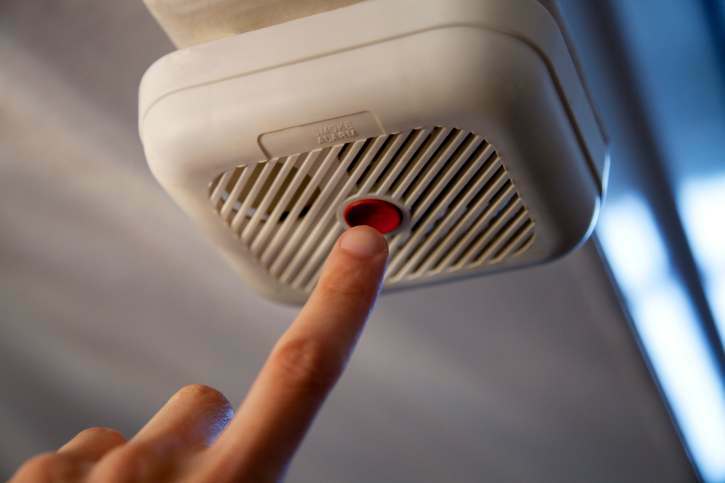 Smoke detectors should be installed at least one per 1,000 square feet and on each level of the home including stair landings and hallways. Heat sensors should be placed in the kitchen, laundry room, garage and mechanical areas. Both should be tested frequently, and batteries should be checked regularly to make sure they work. This will slow the spread of fire. Limiting the number of furnishings in a room will also help. 7. Have your chimney professionally inspected each year. The author, Sheila E. Courtney, is the director of risk management at PURE. She began her career in the insurance industry in risk management in 1998, focusing on valuation and loss prevention for unique and historic homes.